Brilliant premise and exploration of some interesting ideas, that unfortunately didn’t quite have enough depth to draw me into the story completely. I have mixed feelings about The Sudden Appearance of Hope. I really wanted to love it, the premise was so interesting, and the style was so unusual. But somehow it still fell a little flat for me. Everything that I loved about the novel had a flip side to it and that’s what has left me sitting on the fence. Once I got used to the writing style of this book I found it had a strangely addictive cadence, a rhythm of words that draws you in. At times it felt like reading modern poetry, with the short choppy sentences, strange line spacing, inconsistent punctuation and capitalisation. I also enjoyed the addition of the dictionary and wikipedia definitions of things. 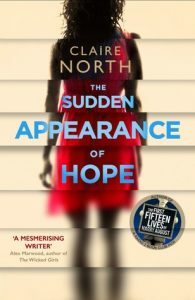 It felt like being inside Hope’s head, which was a very strange place, as she sought knowledge to give herself some kind of permanence. However, I think that these style choices had the overall result of making the book very emotionally detached. I could not feel anything of any of the characters, least of all Hope. The disjointed style left me feeling quite cold about the whole novel. I thought that the premise of someone who is forgotten was a really interesting one. The mechanics of this phenomenon were explained quite well, but that the impact of disappearing was over-explained. The act of being forgotten became more often the focus than the actual action occurring in the book. I can see that North used the ‘disappearing’ as a way in which to examine what it is to be ‘present’ and how so much of what we value about ourselves and others is based on the past, but I felt that there was a disconnect between the intent and the execution. There was so much potential in this book for a brilliant story, but for me it tried to do too much and be too many things, and in doing so missed the opportunity to shine. I’ll definitely be keeping an eye out for more of North’s work, and her work under her actual name, as I enjoyed her views on many topics that were touched on, but this one just wasn’t compelling enough for me to rate higher.